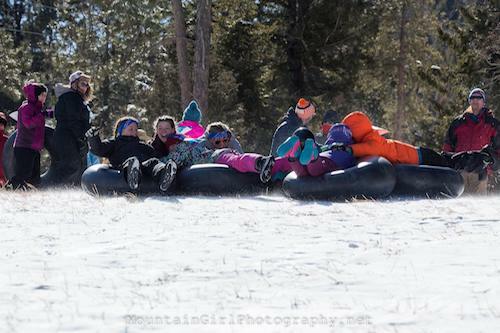 Conifer Chamber's 8th Annual 285 Winterfest Tubing Contest & Craft Crew Crawl! 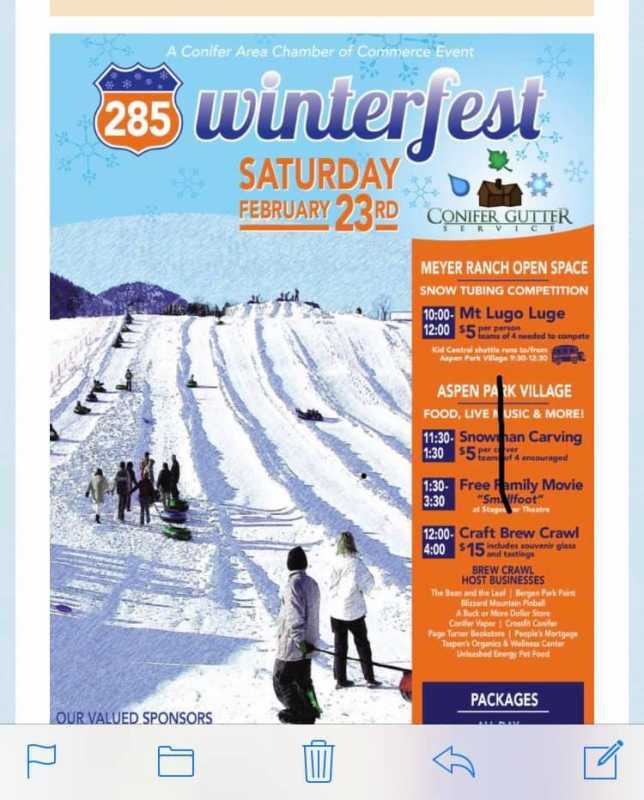 Join us in Conifer on February 23rd for our 8th Annual 285 Winterfest! 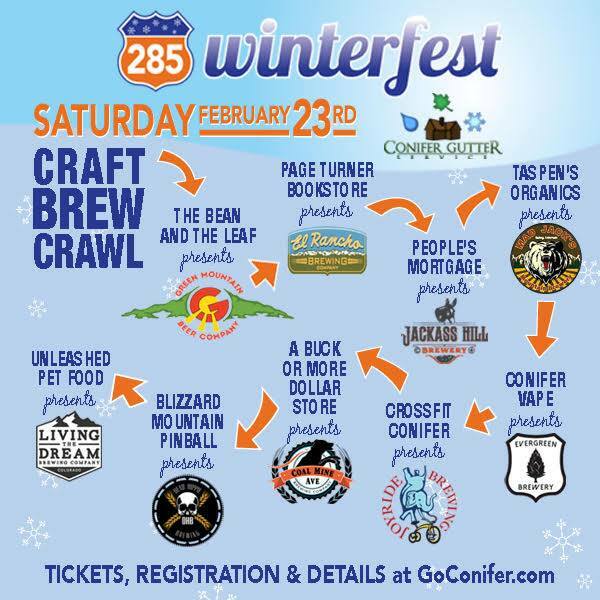 285 Winterfest is presented by Conifer Gutter Service. 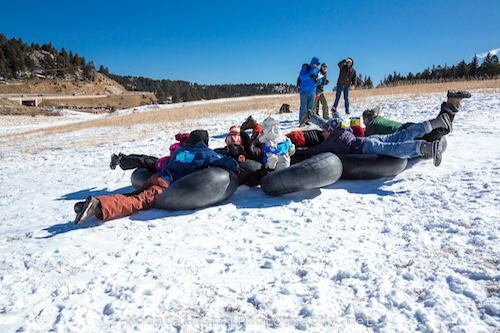 Kick off the morning at 9:30a on the Meyer Ranch Sledding Hill for the Mount Lugo Luge Snow Tubing Competition where teams of 4 compete by tubing down the hill both individually and as a team. Fastest team wins $100! 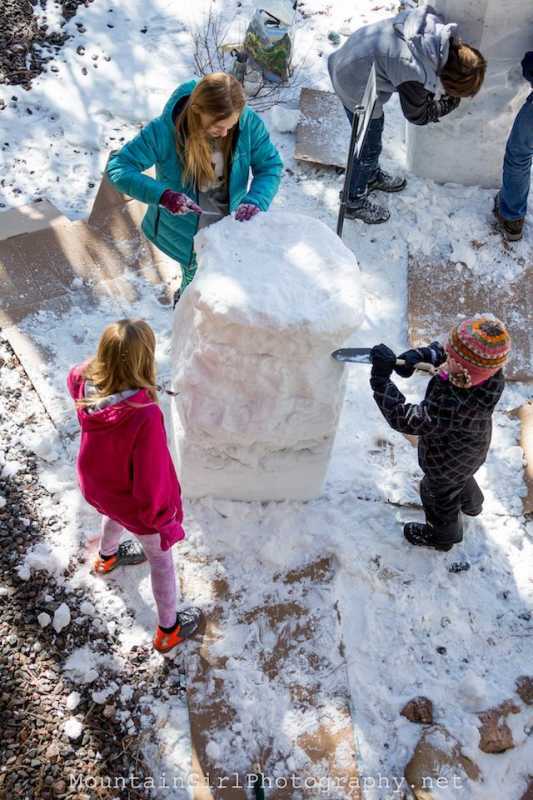 After the Luge, enjoy a winter festival featuring food, live music, snowman carving, free family movie - Smallfoot and beer tasting at Aspen Park Village shopping center. For the adults, a Craft Brew Crawl will be offered at participating businesses in the shopping center. Tickets are $15 and include a souvenir tasting glass and samples from 10 different local craft breweries! Follow our 285 Winterfest Facebook Page for updates! 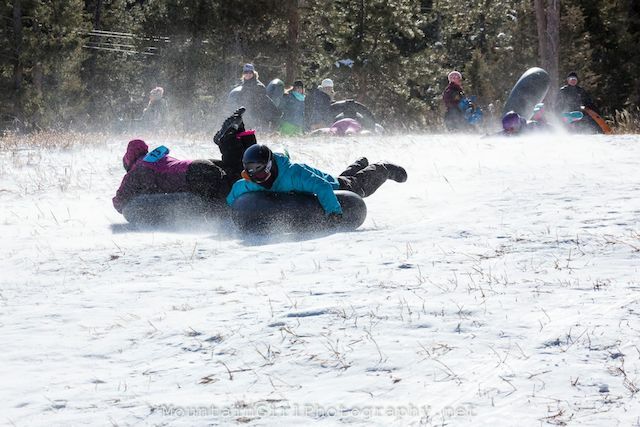 Want to get the family out of the house for snow tubing and beer? Mark your calendars for 285 Winterfest on Saturday, Feb. 23rd., presented by Conifer Gutter Service. Kick off the morning at 9:30a on the Meyer Ranch Sledding Hill for the Mount Lugo Luge Snow Tubing Competition. Then sign up early for our Snowman Carving Competition as reservations are limited. 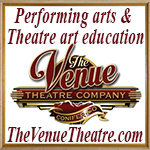 After the snowman carving competition, warm up inside StageDoor Theatre for a free showing of Smallfoot at 1:30p. For the adults, a Craft Brew Crawl will be offered at participating businesses in the Aspen Park Village Shopping center. Thanks to The Bean & The Leaf for sponsoring Green Mountain Beer Company at 285 Winterfest coming up on Saturday, Feb. 23rd! Tickets for the event are $15 and include a souvenir tasting glass and samples from 9 different local craft breweries! The Bean & The Leaf is a family owned and operated local business that opened its doors to the Conifer community in early 2017. A passion of Stephanie (owner) and Megs (daughter). Their mission is to simply share their love for all things. Coffee, tea, herbs & spices and more with this amazing foothill community. They offer gourmet fresh roasted whole bean coffees (single origin & blends - Organic & Fair Trade Cert. options), loose leaf & bagged teas (Organic & Fair Trade Cert. options), bulk & in a jar varieties of natural/filler free herbs & spices, naturally infused olive oils & balsamic vinegar's, local raw honey (Frangiosa Farms), authentic British fruit preserves, local caramel sauces, popcorn's, glazes, syrups, mustard's, tapenades, candles, Leanin' Tree cards, local pickles (PickleBear), mugs, chocolates, bath & body, kitchen accessories & much more! Stop in today to get your foodie fix on! See you soon! Thanks to Page Turner Bookstore for sponsoring El Rancho Brewing Company! Thanks to Peoples Mortgage Company for sponsoring Jackass Hill Brewery! Peoples Mortgage Company has been servicing our clients for over 20 years, and has been a local presence right here in Conifer for over 5 years. Vicki Borns alone has 25 years’ worth of mortgage lending experience and is her for you and all your mortgage lending needs. Her office is located in Aspen Park Village. 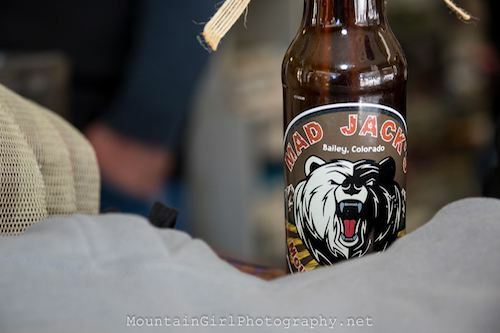 Thanks to Taspen's Cosmic Kitchen for sponsoring Mad Jack's Mountain Brewery! Taspen's Cosmic Kitchen, Taspen's Organics & Dragonfly Botanicals HEMP CBD hand craft the cleanest, holistic, healing products, creams & food in the world! Have you ever looked at the ingredients on product labels & wondered, "What the heck is that?" Taspen's Organics family run business began with a vision in 2008 to bring the world CLEAN, ORGANIC healing products with labels anyone can read, find relief from pain & ailments & to provide the HIGHEST QUALITY products in the world! Thanks to Conifer VAPOR for sponsoring Evergreen Brewing Company! Thanks to A Buck or More Dollar Store for sponsoring Coal Mine Ave Brewing! A Buck or More Dollar Store where most items are $1 but some items up to $3. The Grand Opening of this store is on Feb. 23rd! 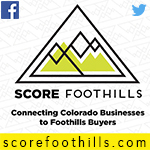 Welcome to the neighborhood from all your Conifer Area Chamber of Commerce members. Thanks to CrossFit Conifer for sponsoring Joyride Brewing Company! At CrossFit Conifer, we believe fitness should be challenging yet inclusive. Our members range in age from 6 to 70-plus, because anyone can do CrossFit. Our experienced and diverse group of trainers safely lead each class through a series of functional movements that are designed to help you improve your life, fitness, and overall wellbeing. Stop by our gym if you have any questions about how we can get you moving toward a healthier you. Thanks to Blizzard Mountain Pinball for sponsoring Dead Hippie Brewing! 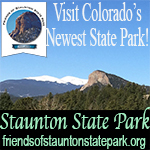 Come enjoy playing 37 pinball machines and other arcade games in Conifer! Three ways to play: Quarters, swipe-card, or $10 for an hour of unlimited play! We can also host birthday parties and other special events in our party room. Ask us about our leagues and tournaments! Thanks to Unleashed Pet Foods for sponsoring Living The Dream Brewing Co.! At Unleashed Pet Foods we offer counseling and guidance from foods to harnesses. Bright clean environment that hosts bio resonance food testing, an integrative veterinarian, laser sessions and more. 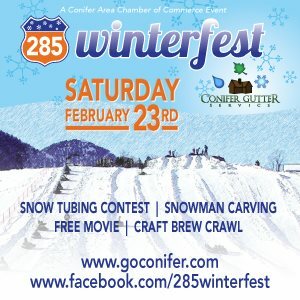 Conifer Area Chamber of Commerce would like to thank Conifer Gutter Service for the tubing hill, the snowman carving, the movie, and the craft beer crawl. Kick off the morning at 9:30a on the Meyer Ranch Sledding Hill for the Mount Lugo Luge Snow Tubing Competition. Teams of 4 compete by tubing down the hill both individually and as a team with awards for the fastest and best aerial dismount. Entries are $5 per participant. Teams of 4 required. Event parking available at Aspen Park Village shopping center. Shuttle service available to the park provided by Kid Central. Fastest team wins $100! Sign up now for our 3rd Annual Snowman Carving Competition as reservations are limited. Teams of 4 compete between 11:30a - 1:30p to carve the most creative snowman. Carving tools provided, props encouraged. Voting is based on people’s choice. Entries are $5 per carver. Teams of 4 required. Businesses sponsoring the Snowman Carving Competition are Evergreen, Bailey & Conifer Macaroni Kid and Mountain Hearth & Patio - thank you sponsors! 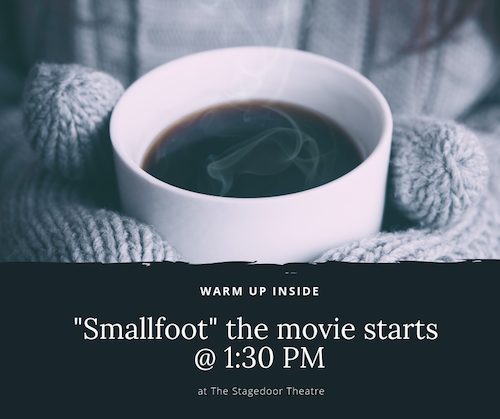 After the snowman carving competition, warm up inside StageDoor Theatre for a free showing of Smallfoot at 1:30p. Craft Brew Crawl sponsored by Conifer Gutter Service will be offered at participating businesses in the shopping center from 12:00-4:00p. Tickets are $15 and include a souvenir tasting glass and samples from 9 different local craft breweries! We look forward to seeing you all at Winterfest tomorrow! 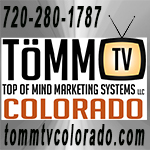 A super big "shout-out" to all our sponsors for this coming weekends event!